Eden Mill distillery and brewery has submitted plans for an ambitious new £4 million expansion in Fife. Under the plans submitted to Fife Council, Eden Mill will extend its Guardbridge premises to increase the production of its whisky, gin and beer, as well as continue to experiment on new products. 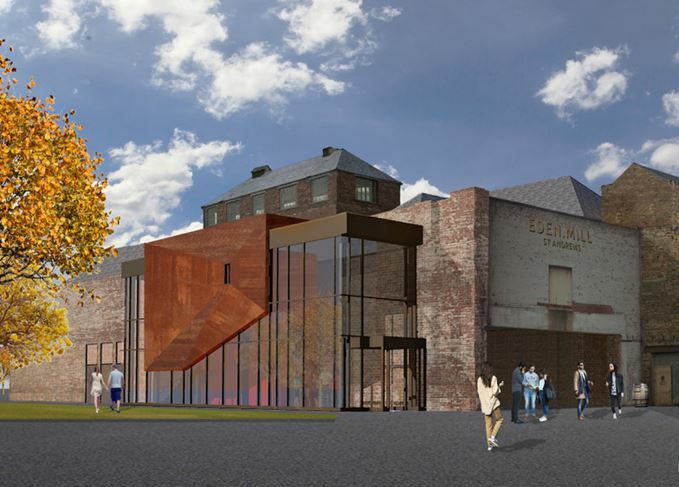 The proposals also include plans for a café/ bar, visitor centre, shop, presentation room and a VIP tasting area, enabling Eden Mill to accommodate over 50,000 tourists per year. The distillery’s expansion will see it occupy the Guardbridge Paper Mill on the University of St Andrews’ Eden Campus, which is also the former site of Seggie distillery. A 19th century distillery founded by the Haig family, Seggie was among the first to adopt a Coffey still for producing grain whisky in 1845. Paul Miller, co-founder of Eden Mill, said: ‘With ambitions to grow the business, it’s the right time for Eden Mill to move forward with plans for a new distillery and brewery. Eden Mill was Scotland’s first modern combined brewery and distillery when it began producing whisky at Guardbridge in 2014. While its whisky is yet to be released, Eden Mill is known for its experimental work in distilling barley with different roasting levels. Once built, Eden Mill will work alongside other tenants at the Eden Campus, including a biomass energy centre, to grow a ‘sustainable local economic model’. ‘We firmly believe that this development will greatly benefit the local area and the wider Scottish economy, which is always what we have set out to achieve as a business,’ Miller said. Eden Mill’s founder discusses the flavour impact of chocolate malt, and the Hipflask series.